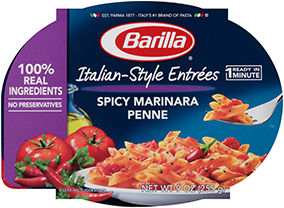 Enjoy a variety of Italian-inspired recipes, all created with Italy's #1 brand of pasta and sauces. Our Sausage & Tomato Rotini Entreé is made with real Italian sausage and has 14g of protein. Enjoy this quick and flavorful meal anywhere, anytime, in just 60 seconds. Sausage & Tomato Rotini Entreé is made with non-GMO ingredients. For more information, please read our position. This delicious recipe combines vine-ripened tomatoes and Italian sausage seasoned with onion, celery, carrots and spices. Combined with perfectly prepared Barilla Rotini pasta for a delicious meal to be enjoyed anywhere.